I know what you are thinking another pumpkin recipe! Tis the season for pumpkin, hopefully I haven't burnt you out on it quite yet. I can never get enough of pumpkin this time of year so bare with me. 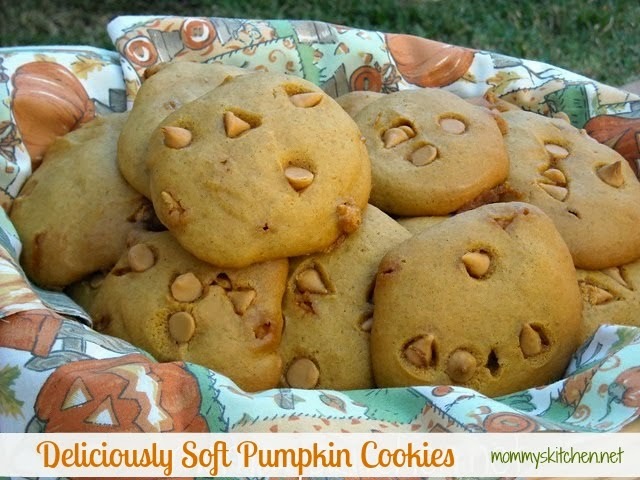 I found this recipe for Soft Pumpkin Cookies at Joy the Bakers site. When I saw the recipe I knew it was a must to bake. Have y'all been to Joys Site? If you haven't you really need to hop on over an check it out. Joys site is pretty much awesome if I had to put it into words. I have made a bunch of her recipes and they always turn out great. This cookie recipe combines the flavors of pumpkin and butterscotch chips. And y'all know I have mentioned how much I love butterscotch chips. Combined they make on pretty darn good cookie. On my previous cookie recipe for Pumpkin Oatmeal Scotchies, that cookie is more of a firmer crispier cookie. This recipe yields more of a cake like cookie. I think you should bake up both cookie recipes so you can have one of each LOL. My little guy Carson who is my pumpkin lover, said these cookies are really good. So I think you can trust the opinion of a picky 6 year old not to steer you wrong. Carson is adding the sugar. This is my first official picture with my New Red Kitchen Aid Artisan Mixer. I am so in love with it and feel like such a pro now! Mackenzie named her Red Hot Sally I think it is a very fitting name. OK on with the rest of the cookie recipe. add vanilla extract, eggs, pumpkin and oil. then add the flour mixture slowly to the bowl. Hm Gracie is being a slacker. She decided eating the butterscotch chips was way better than her breakfast and helping. Carson was out sick from school so I had two helpers in the kitchen Carson and Gracie! Carson was so sweet he moved over as much as he could on the step stool so Gracie could see. Carson added even more butterscotch chips, he didn't think they had quite enough. Then just bake them up. um mm all finished and cooled. Yummilicous cookies. Stop the mixer and scrape the sides of the bowl as needed during mixing. On low speed, mix the oil, pumpkin, and vanilla until blended. Mix in the flour mixture to incorporate it. Mix in the chips. Using an ice cream scoop with a 1/4-cup capacity, scoop mounds of the dough onto the prepared baking sheets, spacing the cookies at least 2 1/2-inches apart. Use a thin metal spatula to smooth and flatten the rounds. Bake the cookies one sheet at a time until the tops feel firm and a toothpick inserted in the center comes out dry, about 16 minutes. Cool them on the baking sheet for 5 minutes, then use a wide metal spatula to transfer the cookies to a wire rack to cool completely. These cookies look yummy! My mom never let me out of bed if I was sick--how awesome for Carson! Love the photo story with your boy! Also, those pumpkin cookies look absolutely delicious! Thanks for the great recipe. I'm always looking for new desserts to bake during the holidays. These look great! I love Joy's site also :) I love Oatmeal Scotchies so I trust your word about these also :) Yummm! I love pumpkin too....I just posted a pumpkin smoothie recipe on my blog! Mmm, those look like they would be good with cream cheese frosting sandwiched between them. Yum! Oh, Tina...bring on the pumpkin recipes! We have had so much pumpkin and I'm still not burnt out yet. lol I made Pumpkin Butterscotch Muffins this week and they were a huge hit! (recipe from Amy at Finer Things) I have Chocolate Pumpkin Oatmeal on my breakfast menu for next week....can't wait to try it! Also, I love Joy the Baker...have you tried her Brown Sugar Bacon Waffles?? I have had these on my "to try" list for awhile...maybe I'll get to make them during the holidays. Take Care! Go Red Hot Sally!!!! She's a beauty as are those cookies!!!! anonymous, my mother never let me out of bed either. How can you resist such a sweet little face asking if they could help. Kelley i need to check out the pumpkin smoothie recipe. Sounds great. I made pumpkin lattes the other night, still need to post that. They were awesome. Stephanie that would be perfect little pumpkin cream pies. Julie I havent tried the waffles yet. Have you tried her pumpkin pie bars now they look awesome. Thank you Steph. The day i brought the kitchenaid home I felt like i was bringing home a new baby.I am such a dork LOL!! But I love it!! Just found your site when I was Googling "Apple Butter in the Crockpot"! Love it! I'm gonna definitely put your blog on my favorites, so I can come back often. I, too, love Joy's site. I made her 4 ingredient PB cookie and something else...can't remember. You look like you're a fantastic mom! I have a 3 yr. old and an 18 mos. old, so I do try to let my 3 yr. old help some. She'd love to do everything. I just hope that she loves to cook/bake as much as I do. Gonna try those punkin' cookies soon, too! These sound so good. I never heard of this recipe before. I got all the ingredients. Guess I will make these this weekend. You certainly have some adorable little kitchen helpers. The cookies look fantastic! This is truly a work of art! All of your recipe are simply gorgeous.Thanks for sharing it.. These look amazing! Happy SITS Saturday Sharefest!! Visiting from SITS and these look delicious! Have you tried pumpkin-chocolate chip muffins? If not, I've got a great recipe for you! I just found your blog this afternoon....your recipes look delish!!!! (So I'm now a 'follower'!) Just love seeing your kids getting right in there with you!! I have 2 boys, and my oldest (almost 4) just loves baking with me too!! I have made these twice already. Love them! They are my new favorite pumpkin cookie recipe. My son loves them with out the chips and with cream cheese frosting. Thanks so much for posting.